Download "MHRA GMP Data Integrity Definitions and Guidance for Industry March 2015"
1 MHRA GMP Data Integrity Definitions and Guidance for Industry Introduction: Data integrity is fundamental in a pharmaceutical quality system which ensures that medicines are of the required quality. This document provides MHRA guidance on GMP data integrity expectations for the pharmaceutical industry. This guidance is intended to complement existing EU GMP relating to active substances and dosage forms, and should be read in conjunction with national medicines legislation and the GMP standards published in Eudralex volume 4. 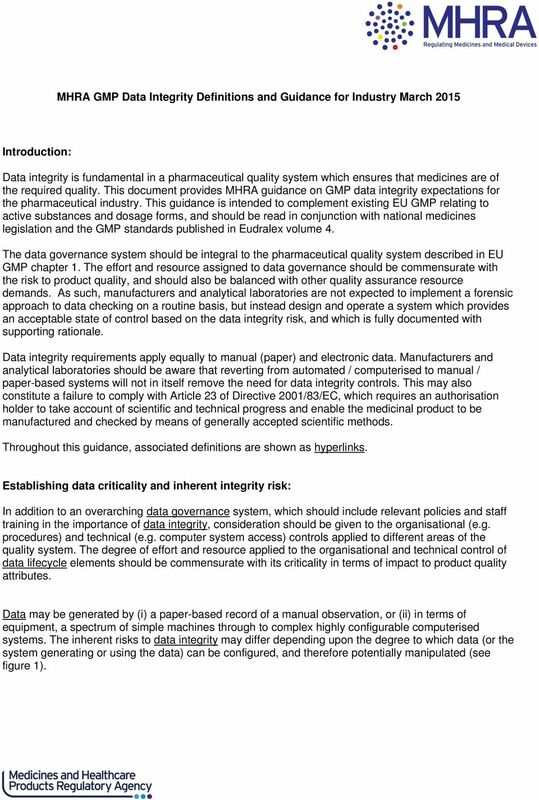 The data governance system should be integral to the pharmaceutical quality system described in EU GMP chapter 1. The effort and resource assigned to data governance should be commensurate with the risk to product quality, and should also be balanced with other quality assurance resource demands. As such, manufacturers and analytical laboratories are not expected to implement a forensic approach to data checking on a routine basis, but instead design and operate a system which provides an acceptable state of control based on the data integrity risk, and which is fully documented with supporting rationale. 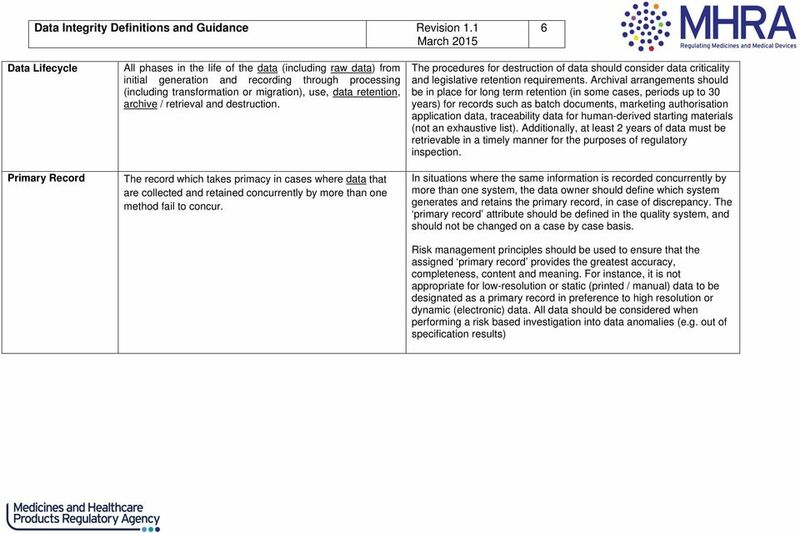 Data integrity requirements apply equally to manual (paper) and electronic data. Manufacturers and analytical laboratories should be aware that reverting from automated / computerised to manual / paper-based systems will not in itself remove the need for data integrity controls. This may also constitute a failure to comply with Article 23 of Directive 2001/83/EC, which requires an authorisation holder to take account of scientific and technical progress and enable the medicinal product to be manufactured and checked by means of generally accepted scientific methods. Throughout this guidance, associated definitions are shown as hyperlinks. 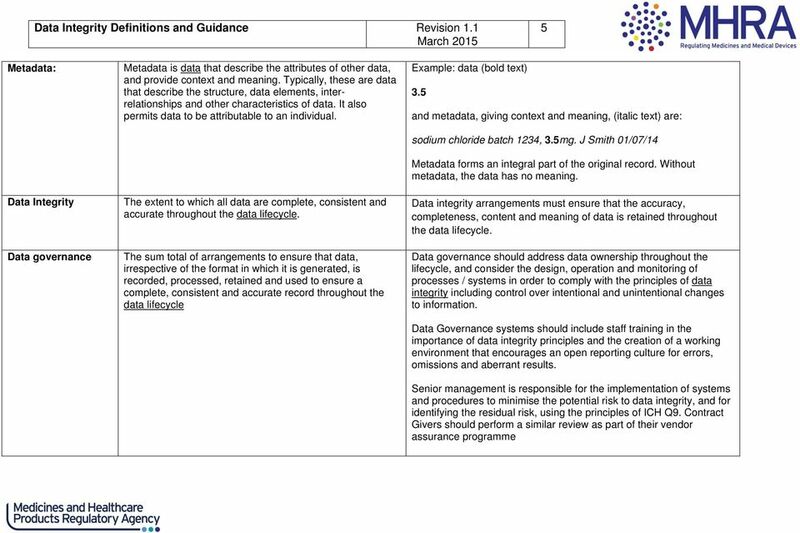 Establishing data criticality and inherent integrity risk: In addition to an overarching data governance system, which should include relevant policies and staff training in the importance of data integrity, consideration should be given to the organisational (e.g. procedures) and technical (e.g. computer system access) controls applied to different areas of the quality system. The degree of effort and resource applied to the organisational and technical control of data lifecycle elements should be commensurate with its criticality in terms of impact to product quality attributes. 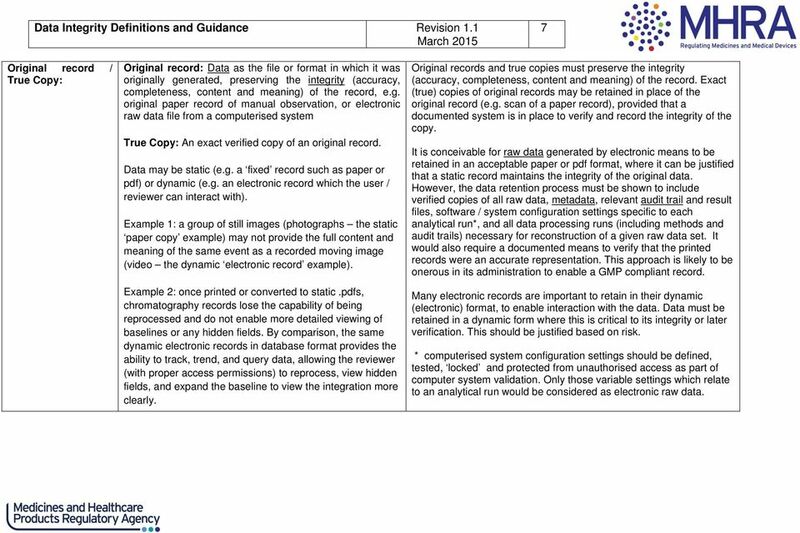 Data may be generated by (i) a paper-based record of a manual observation, or (ii) in terms of equipment, a spectrum of simple machines through to complex highly configurable computerised systems. 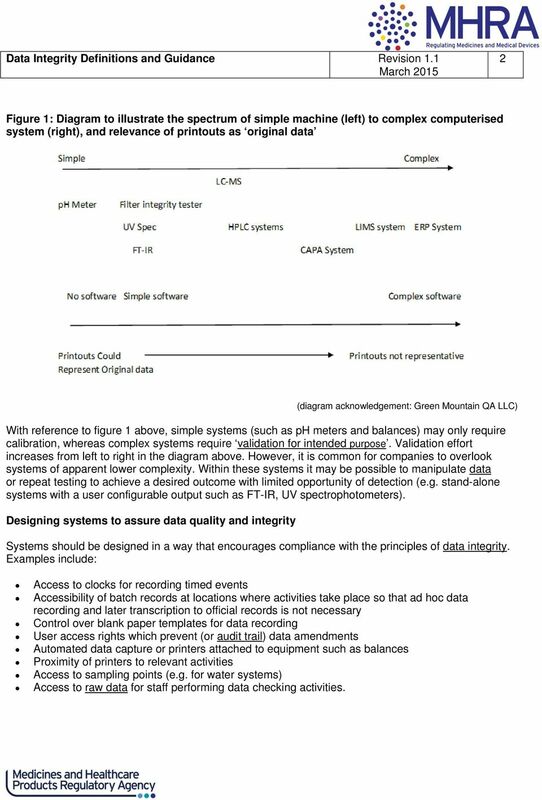 The inherent risks to data integrity may differ depending upon the degree to which data (or the system generating or using the data) can be configured, and therefore potentially manipulated (see figure 1). 2 2 Figure 1: Diagram to illustrate the spectrum of simple machine (left) to complex computerised system (right), and relevance of printouts as original data (diagram acknowledgement: Green Mountain QA LLC) With reference to figure 1 above, simple systems (such as ph meters and balances) may only require calibration, whereas complex systems require validation for intended purpose. Validation effort increases from left to right in the diagram above. However, it is common for companies to overlook systems of apparent lower complexity. Within these systems it may be possible to manipulate data or repeat testing to achieve a desired outcome with limited opportunity of detection (e.g. stand-alone systems with a user configurable output such as FT-IR, UV spectrophotometers). Designing systems to assure data quality and integrity Systems should be designed in a way that encourages compliance with the principles of data integrity. Examples include: Access to clocks for recording timed events Accessibility of batch records at locations where activities take place so that ad hoc data recording and later transcription to official records is not necessary Control over blank paper templates for data recording User access rights which prevent (or audit trail) data amendments Automated data capture or printers attached to equipment such as balances Proximity of printers to relevant activities Access to sampling points (e.g. for water systems) Access to raw data for staff performing data checking activities. 3 3 The use of scribes to record activity on behalf of another operator should be considered exceptional, and only take place where: The act of recording places the product or activity at risk e.g. documenting line interventions by sterile operators. To accommodate cultural or staff literacy / language limitations, for instance where an activity is performed by an operator, but witnessed and recorded by a Supervisor or Officer. 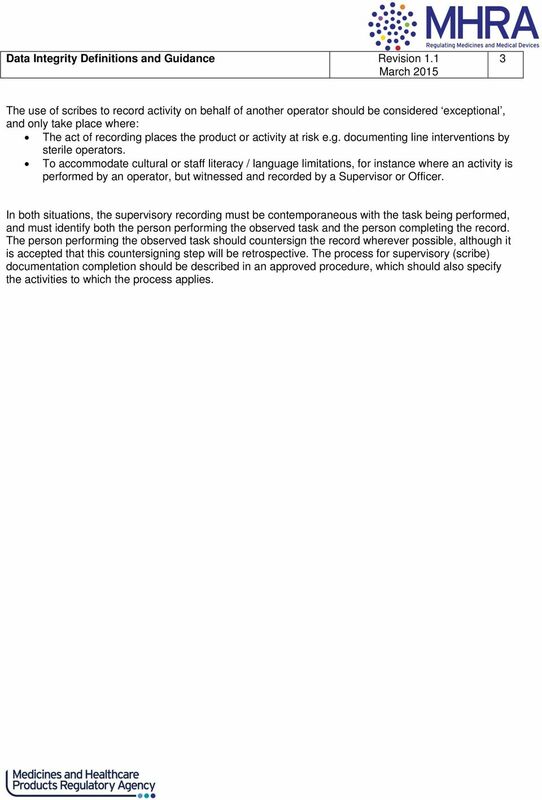 In both situations, the supervisory recording must be contemporaneous with the task being performed, and must identify both the person performing the observed task and the person completing the record. The person performing the observed task should countersign the record wherever possible, although it is accepted that this countersigning step will be retrospective. The process for supervisory (scribe) documentation completion should be described in an approved procedure, which should also specify the activities to which the process applies. 4 4 4 Term Definition Expectation / guidance (where relevant) Data Raw data Information derived or obtained from raw data (e.g. a reported analytical result) Original records and documentation, retained in the format in which they were originally generated (i.e. paper or electronic), or as a true copy. Raw data must be contemporaneously and accurately recorded by permanent means. In the case of basic electronic equipment which does not store electronic data, or provides only a printed data output (e.g. balance or ph meter), the printout constitutes the raw data. Data must be: A - attributable to the person generating the data L legible and permanent C contemporaneous O original record (or true copy ) A - accurate Raw data must: Be legible and accessible throughout the data lifecycle. Permit the full reconstruction of the activities resulting in the generation of the data In the following definitions, the term 'data' includes raw data. 7 7 7 Original record / True Copy: Original record: Data as the file or format in which it was originally generated, preserving the integrity (accuracy, completeness, content and meaning) of the record, e.g. original paper record of manual observation, or electronic raw data file from a computerised system True Copy: An exact verified copy of an original record. Data may be static (e.g. a fixed record such as paper or pdf) or dynamic (e.g. an electronic record which the user / reviewer can interact with). Example 1: a group of still images (photographs the static paper copy example) may not provide the full content and meaning of the same event as a recorded moving image (video the dynamic electronic record example). Example 2: once printed or converted to static.pdfs, chromatography records lose the capability of being reprocessed and do not enable more detailed viewing of baselines or any hidden fields. By comparison, the same dynamic electronic records in database format provides the ability to track, trend, and query data, allowing the reviewer (with proper access permissions) to reprocess, view hidden fields, and expand the baseline to view the integration more clearly. Original records and true copies must preserve the integrity (accuracy, completeness, content and meaning) of the record. Exact (true) copies of original records may be retained in place of the original record (e.g. scan of a paper record), provided that a documented system is in place to verify and record the integrity of the copy. It is conceivable for raw data generated by electronic means to be retained in an acceptable paper or pdf format, where it can be justified that a static record maintains the integrity of the original data. However, the data retention process must be shown to include verified copies of all raw data, metadata, relevant audit trail and result files, software / system configuration settings specific to each analytical run*, and all data processing runs (including methods and audit trails) necessary for reconstruction of a given raw data set. It would also require a documented means to verify that the printed records were an accurate representation. This approach is likely to be onerous in its administration to enable a GMP compliant record. Many electronic records are important to retain in their dynamic (electronic) format, to enable interaction with the data. Data must be retained in a dynamic form where this is critical to its integrity or later verification. This should be justified based on risk. * computerised system configuration settings should be defined, tested, locked and protected from unauthorised access as part of computer system validation. Only those variable settings which relate to an analytical run would be considered as electronic raw data. 9 9 9 Figure 2: Logical design permitting contemporaneous recording of addition of a single material in a manufacturing unit of work. This record is permanently recorded (step 2), with audit trail, before progressing to next unit of work. Figure 3: Logical design permitting the addition of multiple materials in a manufacturing unit of work before committing the record to durable media. 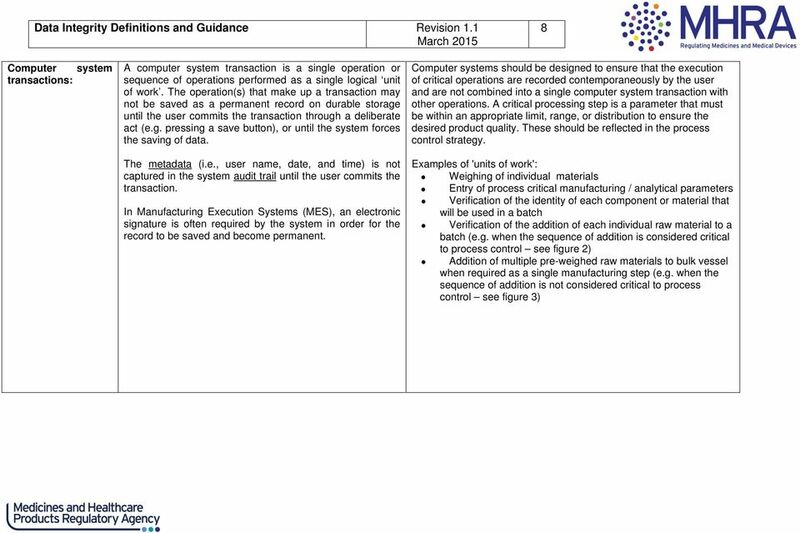 Steps 1, 3 and 5 are contemporaneous entries (bar code), but are not permanently recorded with audit trail until step 6. 10 10 10 Audit Trail GMP audit trails are metadata that are a record of GMP critical information (for example the change or deletion of GMP relevant data), which permit the reconstruction of GMP activities. Where computerised systems are used to capture, process, report or store raw data electronically, system design should always provide for the retention of full audit trails to show all changes to the data while retaining previous and original data. It should be possible to associate all changes to data with the persons making those changes, and changes should be time stamped and a reason given. Users should not have the ability to amend or switch off the audit trail. The relevance of data retained in audit trails should be considered by the company to permit robust data review / verification. The items included in audit trail should be those of relevance to permit reconstruction of the process or activity. It is not necessary for audit trail review to include every system activity (e.g. user log on/off, keystrokes etc. ), and may be achieved by review of designed and validated system reports. Audit trail review should be part of the routine data review / approval process, usually performed by the operational area which has generated the data (e.g. laboratory). There should be evidence available to confirm that review of the relevant audit trails have taken place. 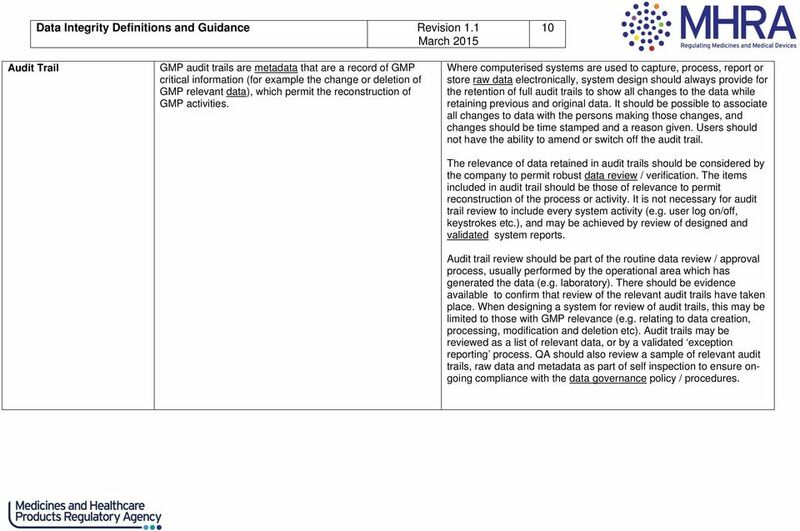 When designing a system for review of audit trails, this may be limited to those with GMP relevance (e.g. relating to data creation, processing, modification and deletion etc). 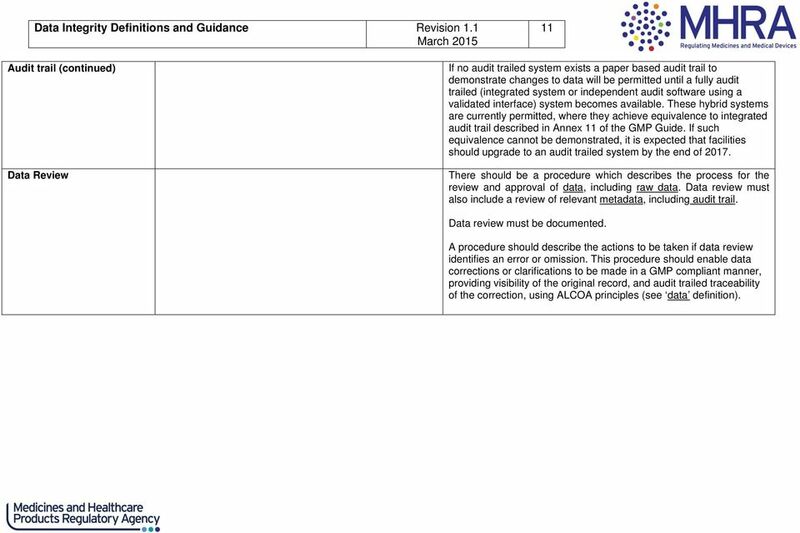 Audit trails may be reviewed as a list of relevant data, or by a validated exception reporting process. QA should also review a sample of relevant audit trails, raw data and metadata as part of self inspection to ensure ongoing compliance with the data governance policy / procedures. 11 11 11 Audit trail (continued) Data Review If no audit trailed system exists a paper based audit trail to demonstrate changes to data will be permitted until a fully audit trailed (integrated system or independent audit software using a validated interface) system becomes available. 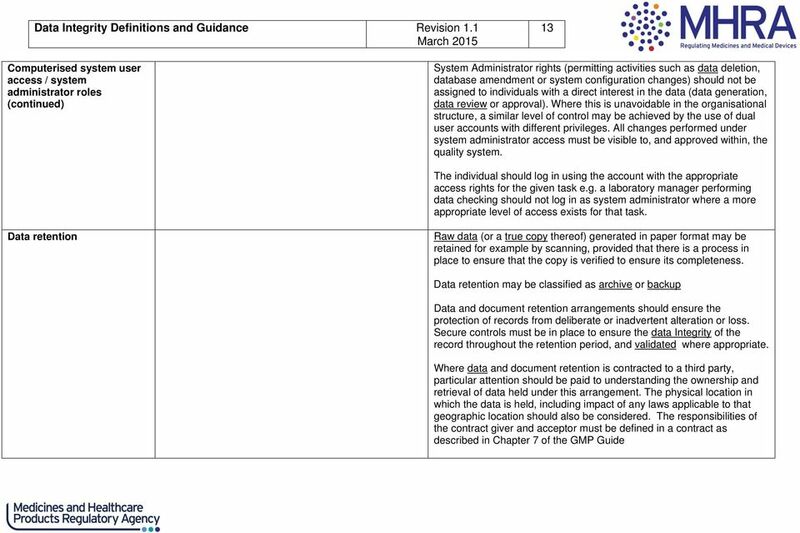 These hybrid systems are currently permitted, where they achieve equivalence to integrated audit trail described in Annex 11 of the GMP Guide. If such equivalence cannot be demonstrated, it is expected that facilities should upgrade to an audit trailed system by the end of There should be a procedure which describes the process for the review and approval of data, including raw data. 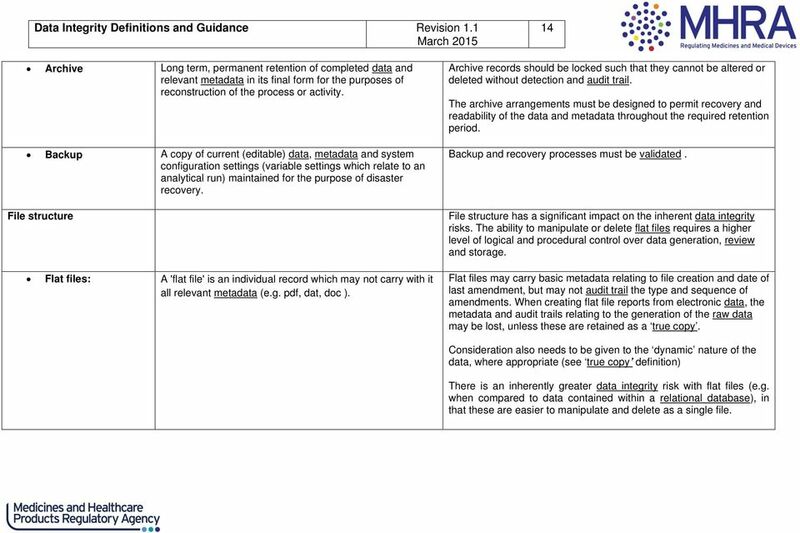 Data review must also include a review of relevant metadata, including audit trail. Data review must be documented. A procedure should describe the actions to be taken if data review identifies an error or omission. 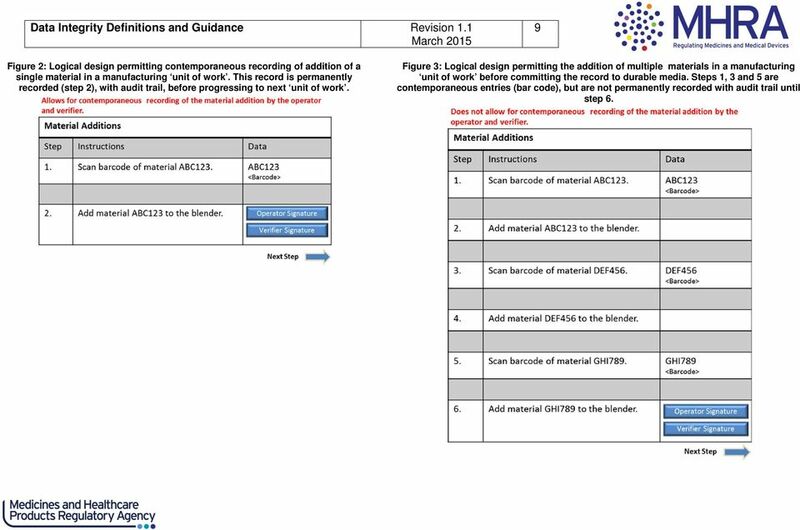 This procedure should enable data corrections or clarifications to be made in a GMP compliant manner, providing visibility of the original record, and audit trailed traceability of the correction, using ALCOA principles (see data definition). 12 12 12 Computerised system user access / system administrator roles Full use should be made of access controls to ensure that people have access only to functionality that is appropriate for their job role, and that actions are attributable to a specific individual. Companies must be able to demonstrate the access levels granted to individual staff members and ensure that historical information regarding user access level is available. Shared logins or generic user access should not be used. Where the computerised system design supports individual user access, this function must be used. This may require the purchase of additional licences. It is acknowledged that some computerised systems support only a single user login or limited numbers of user logins. Where alternative computerised systems have the ability to provide the required number of unique logins, facilities should upgrade to an appropriate system by the end of Where no suitable alternative computerised system is available, a paper based method of providing traceability will be permitted. The lack of suitability of alternative systems should be justified based on a review of system design, and documented. System administrator access should be restricted to the minimum number of people possible taking account of the size and nature of the organisation. The generic system administrator account should not be available for use. Personnel with system administrator access should log in under unique log-ins that allow actions in the audit trail(s) to be attributed to a specific individual. 14 14 14 Archive Long term, permanent retention of completed data and relevant metadata in its final form for the purposes of reconstruction of the process or activity. Backup A copy of current (editable) data, metadata and system configuration settings (variable settings which relate to an analytical run) maintained for the purpose of disaster recovery. File structure Flat files: A 'flat file' is an individual record which may not carry with it all relevant metadata (e.g. pdf, dat, doc ). Archive records should be locked such that they cannot be altered or deleted without detection and audit trail. The archive arrangements must be designed to permit recovery and readability of the data and metadata throughout the required retention period. Backup and recovery processes must be validated. File structure has a significant impact on the inherent data integrity risks. The ability to manipulate or delete flat files requires a higher level of logical and procedural control over data generation, review and storage. Flat files may carry basic metadata relating to file creation and date of last amendment, but may not audit trail the type and sequence of amendments. When creating flat file reports from electronic data, the metadata and audit trails relating to the generation of the raw data may be lost, unless these are retained as a true copy. Consideration also needs to be given to the dynamic nature of the data, where appropriate (see true copy definition) There is an inherently greater data integrity risk with flat files (e.g. when compared to data contained within a relational database), in that these are easier to manipulate and delete as a single file. 15 15 15 Relational database: A relational database stores different components of associated data and metadata in different places. Each individual record is created and retrieved by compiling the data and metadata for review This file structure is inherently more secure, as the data is held in a large file format which preserves the relationship between data and metadata. This is more resilient to attempts to selectively delete, amend or recreate data and the metadata trail of actions, compared to a flat file system. Retrieval of information from a relational database requires a database search tool, or the original application which created the record. 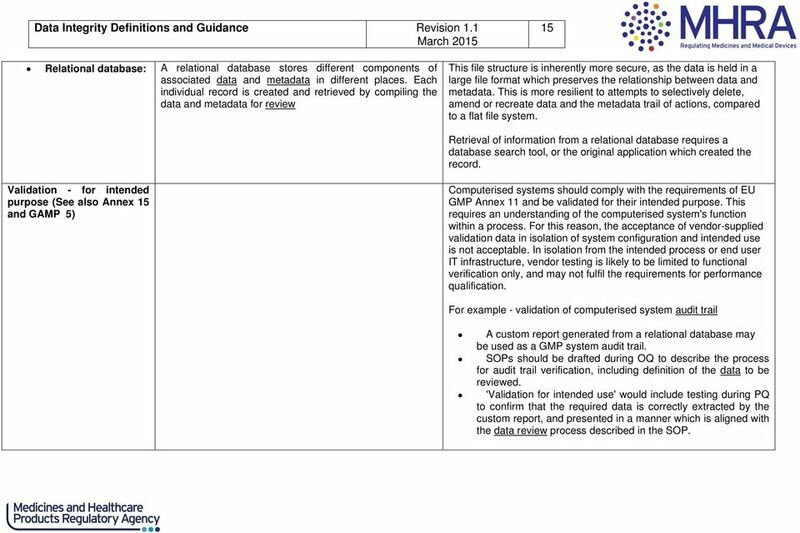 Validation - for intended purpose (See also Annex 15 and GAMP 5) Computerised systems should comply with the requirements of EU GMP Annex 11 and be validated for their intended purpose. This requires an understanding of the computerised system's function within a process. For this reason, the acceptance of vendor-supplied validation data in isolation of system configuration and intended use is not acceptable. In isolation from the intended process or end user IT infrastructure, vendor testing is likely to be limited to functional verification only, and may not fulfil the requirements for performance qualification. 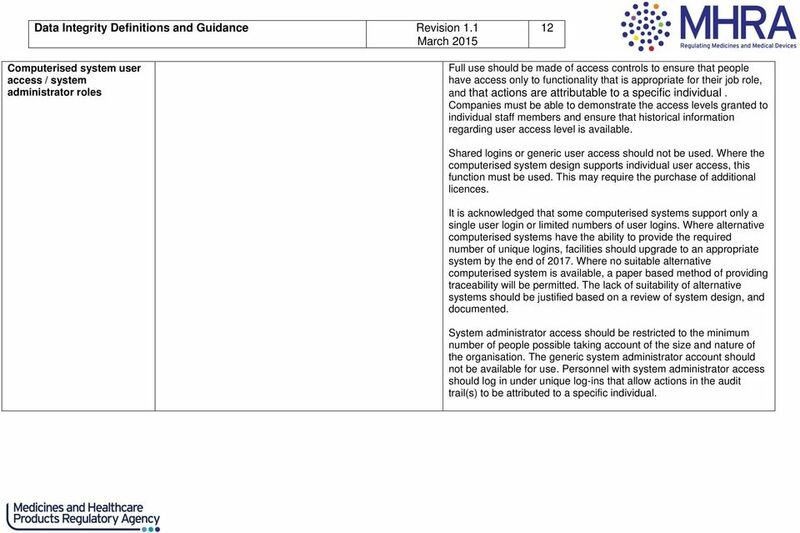 For example - validation of computerised system audit trail A custom report generated from a relational database may be used as a GMP system audit trail. SOPs should be drafted during OQ to describe the process for audit trail verification, including definition of the data to be reviewed. 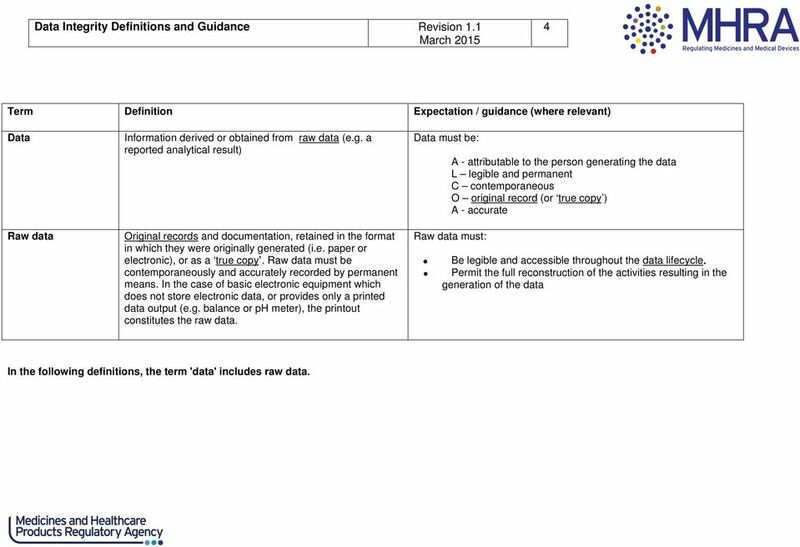 'Validation for intended use' would include testing during PQ to confirm that the required data is correctly extracted by the custom report, and presented in a manner which is aligned with the data review process described in the SOP. 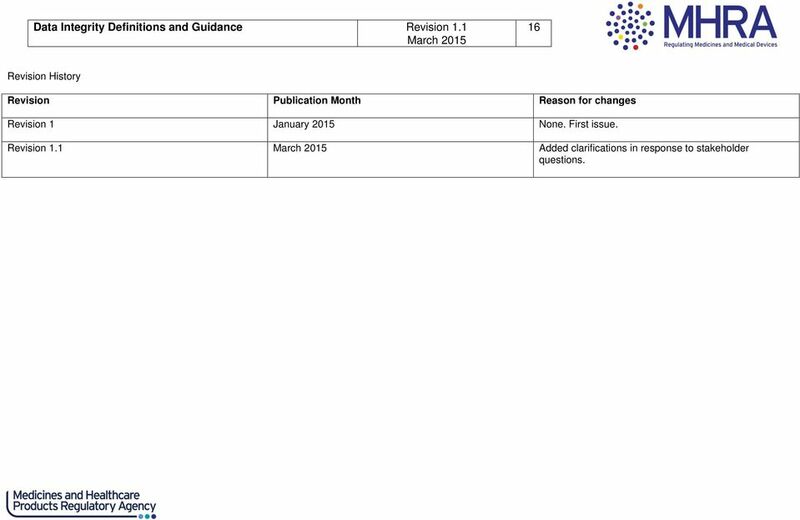 16 16 16 Revision History Revision Publication Month Reason for changes Revision 1 January 2015 None. First issue. Revision 1.1 Added clarifications in response to stakeholder questions. 2.2 INFORMATION SERVICES Documentation of computer services, computer system management, and computer network management. Implementing Title 21 CFR Part 11 (Electronic Records ; Electronic Signatures) in Manufacturing Presented by: Steve Malyszko, P.E. 1 of 11 1. Introduction The International Safe Transit Association (ISTA), a non-profit association whose objective is to prevent product damage and excess packaging usage within the distribution environment. unless the manufacturer upgrades the firmware, whereas the effort is repeated.